Named variously over the millennia, The Fortunate Isles, the Isles of the Blessed, Atlantis, Elysium, the Garden of the Hesperides, the Canary Islands have boasted, since they emerged steaming from the sea, of near-perfect year-round temperatures. A volcanic archipelago off the coast of northwestern Africa, they are among Spain’s farthest-flung territories. Their landscapes include four of the highest peaks within Spanish territory and some bizarre yet inspiring scenery: from black sand beaches with soaring pale cliffs to rugged, red, Mars-like panoramas. Pliny the Elder reported that the islands ‘abound in palm-groves bearing dates and in conifers; …there is a large supply of honey, and papyrus grows in the rivers…’ Indeed, profuse pine forests alternate with extinct volcanoes in a mighty ancient landscape often more lunar than earthly – with colour, not black alone, but pink, blue, purple, ochre: a fiery painter’s palette. 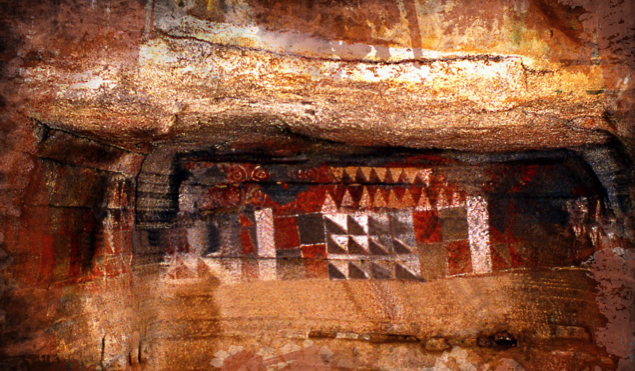 The origin of the islands’ first inhabitants has long been a source of mystery but they have left behind fascinating traces of their perplexities in their rock art in almost modernist squares, triangles, circles, and mazes. By the 19c, Canary Island painters trained in Paris, and imbued with the glories of Impressionism and Fauvism, celebrated the rich colours of the islands in pigment. Canary architecture includes striking black-and white churches such as those in the UNESCO heritage site of La Laguna, with intricate gilded retables and altarpieces. Houses are brilliantly-coloured in hues from sunset red to yellow and violet, and are equipped with beautifully-crafted balconies made from pine heartwood from inland forests; pebbled or Mozarabic-tiled patios are lined with glazed clay pots spilling over with brightly-coloured flowers and Modernista buildings show hints of the drama of Gaudi even from the distance of Barcelona. Cesar Manrique’s remarkable house-studio was excavated from bubbles of lava, as were the dramatic walls and sloping floors of the Tenerife Espacio del Arte, by Tate Modern architects Herzog and De Meuron; meanwhile Santiago Calatrava’s Auditorio rears over the harbour of Tenerife like a pterodactyl. The appeal of the Canary Islands is indeed both up-to-date and profoundly prehistoric. COST £2760 members, £2810 non-members, £260 single room supplement, £250 deposit, includes flights (with hold luggage) London-Tenerife, Gran Canaria-Lanzarote, and Lanzarote-London, ferry Tenerife-Gran Canaria, seven nights accommodation, all breakfasts, five lunches, five dinners with wine, all lectures, all entrance fees, tuition and guiding, private minibus travel during the tour, all gratuities, VAT.